A: Yes. A blower keeps air in the jump unit the entire time. Once unplugged they deflate. That´s why we require an outlet within 50´ of the unit or a generator. Longer cords can pop your circuit breaker so we bring our own heavy duty cords. A: The customer is responsible for notifying the office BY 9 PM the day before if they need to cancel the rental. Once the equipment is delivered, the FULL AMOUNT IS DUE regardless of total time used. All decisions to cancel due to weather or any other reason need to be made the day before. We ask that the customer be informed of all weather conditions approaching by watching or listening to their local news. 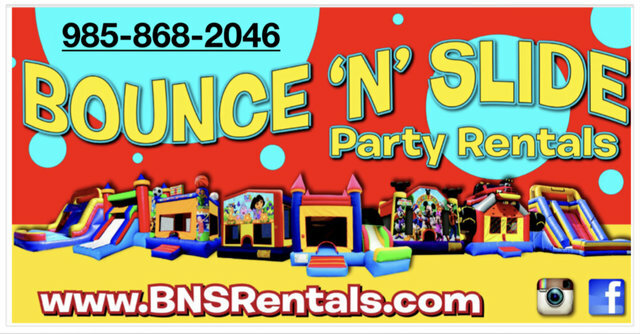 Please understand all bounce houses or combos may get wet from the sides or the emergency escape on top. Some inflatables do not have tops. A: All orders booked require a deposit. The deposit will never be refunded for any reason, but will be credited for a future rental. A: We can set up on Grass (our favorite and best for the kids), dirt, asphalt, and concrete. Sorry, we can´t set up on any type of rocks as the constant rubbing will wear through the vinyl jumps.